Giant Original Italian Movie Poster. Comes in 2 folded pieces, each 40" x 56". A US version like this cound run up to 5 figures! 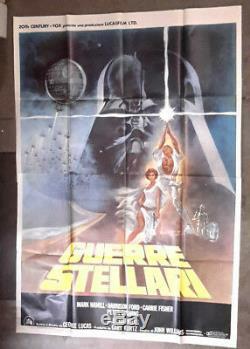 The item "Original 1977 Star Wars Italian Giant Movie Poster- 80x56 Folded-2 Pieces (MH)" is in sale since Friday, December 7, 2018. This item is in the category "Entertainment Memorabilia\Movie Memorabilia\Posters\Originals-International\1970-79". The seller is "intergalactic" and is located in Longwood, Florida. This item can be shipped worldwide.